Jerusalem couldn't wait to celebrate the 50th anniversary of its unification. The week-long Jerusalem Day celebrations started three days early on Sunday night with a fantastic light and sound show projected against the old city walls outside of the Jaffa Gate. 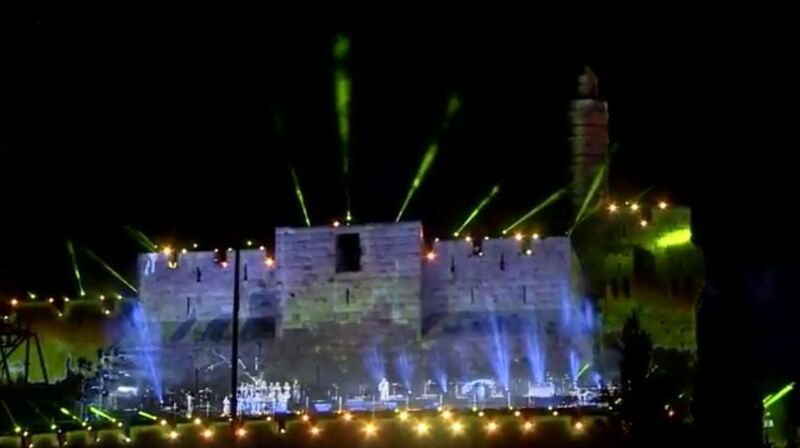 The evening, which was attended by tens of thousands, including President Reuven Rivlin and Prime Minister Binyamin Netanyahu, told the story of the history of Jerusalem. Beginning with the binding of Isaac on Mount Moriah and continuing through Jacob's dream, the history of the city played out including King David, the Temple of Solomon, the Babylonian exile, the return to Zion and rebuilding of the Holy Temple, the Maccabees and the refurbished Temple of Herod and its destruction in the year 70 CE by the Romans. The story resumed in the 16th century as entire Jewish communities began to resettle inside Jerusalem's walls, to the first Jewish settlements outside the walls, the division of the city during Israel's 1948 War of Independence, and climaxed with the liberation and reunification of Jerusalem during the 1967 Six Day War. Jerusalem's old city was liberated on the 28th day of the Hebrew month of Iyar, (tomorrow), which was on June 7, 1967. Israel will be celebrating 50 years since the liberation of Jerusalem throughout the entire week. Washington, D.C. when we heard the news that we had the Kosel. How I remember that day in 1967 when we danced in Lafayette Park opposite the White House in Washington, D.C. when the news came through that we had the Kosel. How I remember that day in 1967 when we danced in Lafayette Park opposite the White House in Washington, D.C. when the news ame through that we had the Kosel.